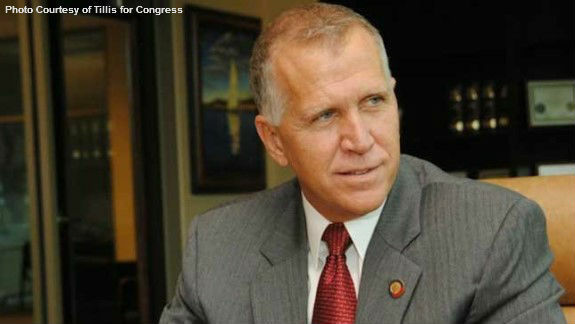 The campaign of Republican U.S. Senate candidate Thom Tillis is touting a new poll that shows him down just two points to Democratic Senator Kay Hagan in North Carolina. It’s great news for conservatives and Republicans hoping to wrest control of the Senate from the Democrats after next month’s elections – and shows the shift in Tillis’ campaign toward issues that matter to conservatives is paying dividends in the opinions of real voters. Current polling backs up the notion that Tillis is gaining. For example, the most recent poll from Survey USA actually shows Tillis ahead by one point. Last week’s USA Today/Suffolk poll has Hagan ahead by two and it may be the one Tillis is referring to in his campaign emails. Regardless of the numbers, most pollsters agree the race is turning in a favorable direction for Tillis. The Real Clear Politics average is still in Hagan’s favor by 1.5 points -- but the race is rated as a toss-up. Why has Tillis apparently turned the tide? National commentators would probably say it’s indicative of the continuing sour mood concerning Democrats in general. But where there’s movement, there’s a reason. It’s likely partly due to the backing of prominent conservatives such as Senator Rand Paul, who not only made a recent visit to the Tar Heel State to talk up Tillis to conservatives, he also is cutting ads for the candidate. Senator Ted Cruz also made an appeal on Tillis’ behalf during a stop in South Carolina. He wasn’t talking directly to North Carolinians at the time, but he appealed to conservatives south of the state border to encourage their northern brethren to work for Tillis. Tillis is also working harder on conservative campaign concerns – including the most salient issues of the election (namely amnesty, national security and Obama’s culture of corruption and lies). Tillis has been linking Hagan to Obama’s disastrous policies and the polling reveals how unpopular they really are. The very real potential of an Ebola invasion is at the forefront of voters’ minds. Tillis was one of the first Republican Senate candidates to call for a ban on travel from Ebola hotspots, like Sierra Leone, Guinea and Liberia from where the virus was brought to the United States and infected nurse Nina Pham. It’s about time Tillis took advantage of the opportunity to tie Hagan to issues of national importance, such as Obama's open borders policy. This isn’t just a local campaign – voting for Democrats has real consequences for all of us. We’re glad Tillis is finally seeming to understand what the election is about – and that his campaign has shifted focus. Hitting Democrats where they’re most vulnerable is the best strategy and it looks like Tillis is doing it. If he continues to do so, the polling on November 4th will likely end up in his favor, too. Go to Thom Tillis' website through this link and tell Thom to keep campaigning on the conservative issues of no amnesty for illegal aliens, border security is national security, ending the culture of lies, lawlessness and corruption with which Obama is poisoning our government and banning travel from Ebola hotspots.